Australia drew 3-3 with New Zealand in Sydney but it was still enough for them to win the Bledisloe Cup for the first time. A try from Australia's Robert Loudon was matched by New Zealand's John Hore in front of 30,000 fans at the Sydney Cricket Ground. 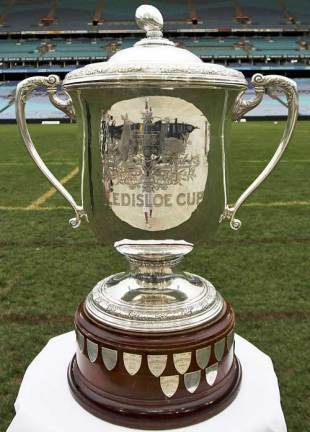 The Bledisloe Cup is named after Lord Bledisloe, the former Governor-General of New Zealand who donated the trophy in 1931, and is contested by the Tasman rivals outside of the Rugby World Cup. The All Blacks have dominated the history of the famous trophy and hold the record for the longest winning run - an impressive string of results spanning 27 years between 1951 and 1978. Hugo Porta's Pumas gave notice of their rising stock after they beat an Auckland side that included four All Blacks 18-13 at Eden Park. The New Zealand Maori held the touring Springboks to a 12-all draw at Napier. Many feel the 'Boks were lucky to have their late equalising drop-goal by Colin Beck awarded. Most at the ground believed his kick sailed wide of its target. The Springboks' seven tries in their 31-6 defeat of West-Coast/Buller Combined at Greymouth were shared among the four threequarters. The Post Office issued a special 9p stamp to commemorate the centenary of the founding of the RFU. There was general surprise at Australia's achievement after holding the All Blacks to a 3-all draw in the opening Test of their series in New Zealand. There was a hat-trick of tries for South Africa's elegant runner on the right-wing, Jannie Engelbrecht, as the tourists beat South Canterbury/Mid Canterbury/North Otago Combined 28-13 at Timaru.